All the more reason to tear down Flashcube. It’s got no historic context and obviously isn’t viable without big subsidies due to condition. It also might be nice to include the lots all the way to Central in a ballpark development. Would need to find a way to include the older building in the far north edge into the design, perhaps as offices similar to Camden Field in Baltimore. West of Wyandotte between 6th and 7th just south of the gas station there is a historic building. I believe it was an old furniture store? It's really the only building that would keep you from building all the way to Central for a larger plot. There’s five owners now for all that land so it’s definently not something Commerce could pull off alone. It used to be four. Also notice it requires moving the bridge the streetcar is on. Not all plans require changing of bridges...it would really depend on the north loop future...be pretty tight without using some of that land. I'd prefer this building just go away....it's a piece of trash. EXACTLY. The north loop would be a terrible location for stadium. I thought people wanted to remove the freeway to bring back the grid and urban fabric. A stadium would do more harm than good. The best location for a stadium in the downtown area would be the east crossroads near the RR tracks and that land is starting to get developed. I don't think KC will ever have a downtown stadium. Just embrace the sports complex and continue to develop downtown. The sports complex is fine. The area around it just needs improved, even just some basic landscaping would do wonders. Philly's sports complex makes the TSP seem ghetto. KC has better stadiums IMO, but the roads, sidewalks, landscaping etc around the TSP is just dreadful. Eventually KC should have some sort of transit to the TSC. Put a decent hotel between the stadiums etc. The TSC could be made to be a lot nicer if downtown is never going to happen. There is no reason to move Arrowhead ever, but if baseball ever does go downtown, it needs to go in the east loop, east crossroads or the parking lots south of crown center. Anything else will just do more harm than good to the vibrancy of the city. That building is the former Barton Brothers Shoe Company warehouse, at 609 Central. It's call the Atrium Lofts now. It sits in a historic district on the National Register. It's been renovated into residential and is in very good condition. It's not getting torn down for some baseball stadium. There would be push-back. 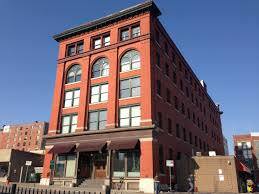 According to the building website, this 5-story building now houses 48 studio, one- and two-bedroom loft condos. All would have to agree to sell en masse for the building to be demolished. 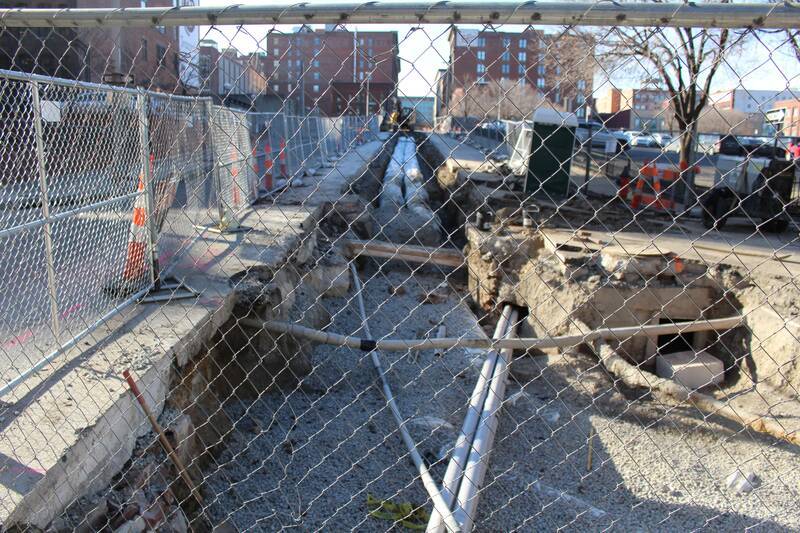 The City could try using eminent domain. However, with 48 homeowners to contend with, there might be lawsuits that could tie up the development for years. 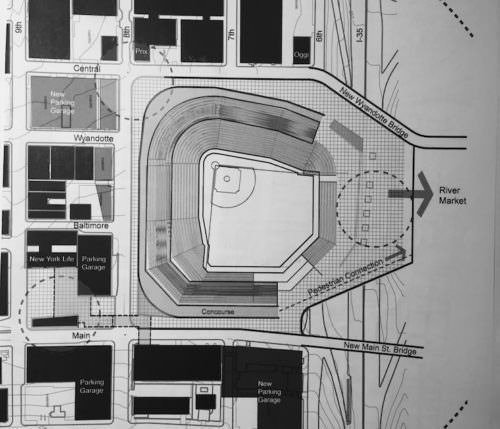 If a stadium were built in the North Loop, it is likely you would have to find replacement parking for Commerce Bank, DST, and the Atrium Lofts West building, since their surface parking would be gone. It would likely require construction of a parking garage on the parcel north of the Savoy Hotel. This would be in addition to the stadium. The site along 19th Street between Oak and Holmes was probably the best location for baseball stadium in that the stadium wouldn't have to be squeezed into a site. No significant building would be torn down. The only existing buildings there now are really just block warehouses. No major excavation. This parcel is physically bigger than the Washington Square Park parcel. This site is now out of contention since developers have bought the parcel at 19th and Oak for apartment development. The Washington Square Park location would result in having to demolish an 11-story commercial office building that is occupied and functional. So, to create a stadium, you would displace hundreds of workers in an area that needs to retain large employers. Where would Blue Cross/Blue Shield go? Kansas? In addition, the site is not level. There would have to be excavation to build the stadium adding to the expense. A stadium would fit on the blocks from Truman Road south to 17th Street between Cherry and the alley just east of Charlotte. Several buildings would have to be demolished, but none that are significant. Charlotte and Holmes, and 16th Street, would have to be closed. Charlotte could potentially be rerouted around the stadium. It's not a bad location since it's still in walking distance to Power & Light, and potential organic entertainment areas on McGee, Oak, and 18th Street in the Crossroads. It has good highway access. Another location would be south of 19th Street between Paseo and Forest Avenue. A couple of buildings would probably require demolition, but nothing significant. It would certainly enhance the 18th Street corridor, and provide more traffic for the 18th and Vine District. A stadium could fit on the south end of Crown Center if you closed 27th Street, and re-routed Grand a bit to the west. Another alternative that no one has ever suggested is placing a stadium just southwest of the Liberty Memorial grounds where the present ball fields are, and the Pioneer Mother statue. Last edited by FangKC on Sun Aug 19, 2018 9:13 am, edited 2 times in total. That's pretty much the nail in the coffin on a stadium in this location. There's no way they'd tear down two registered buildings for a stadium. Right?? I don't really think they are banking those parcels for a future baseball stadium. I think they just don't want to give up their cheap surface parking lots. At least no one has offered them enough to make them consider it. When the New York Life building came up for sale. I was really surprised that Tower Properties didn't buy the building simply to get control of its' attached parking garage. Had they done that, they might have sold off some of their surface lots in the North Loop. 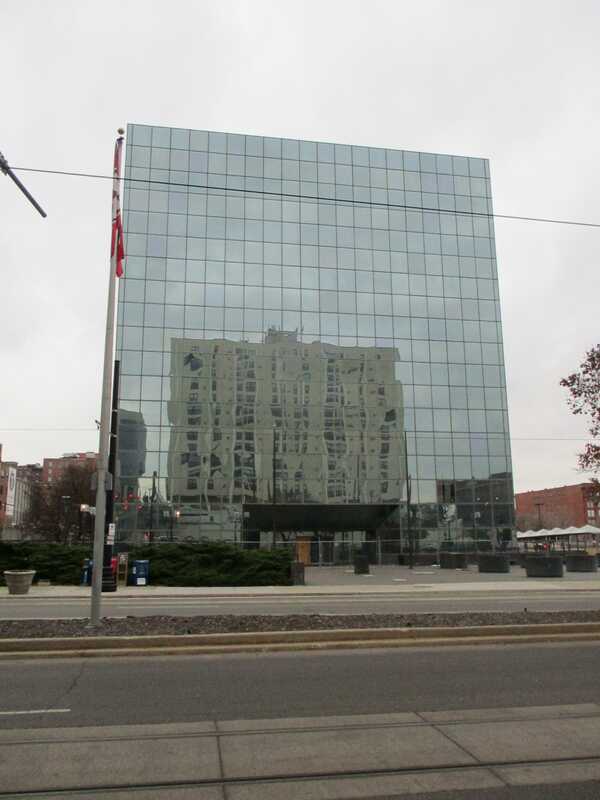 If Tower Properties/Commerce Bank was land-banking for a future baseball stadium, they wouldn't have sold the Flashcube Building to another developer--ruining any chance for putting together enough parcels for the stadium. They would have also purchased the New York Life building to get that garage, so they could have replaced their surface lots if they sold them for the stadium. Need a special assessment tax for surface parking that makes it difficult to justify them financially. Use the revenue to build city-owned parking structures. Terrible might be a little extreme but yes I like the idea of east crossroads. If they are going to do it, they had better figure out a location, and what property to buy now. Available locations downtown are slowly disappearing with each passing year. Once the only locations left to develop are out of walking distance within downtown, or too far away from the streetcar line, then the point of having a downtown stadium disappears, and it might as well stay at TSC. I don’t think that’s new? Been up for 6 months I'd say. HTC$ - just because you can doesnt mean you should. Oh, just saw the pix. that's a Veolia steam line going from RM plant to new Convention hotel.